Gland, Switzerland - The designation of wetlands for conservation with WWF support reached over 100 million hectares worldwide with the declaration of seven sites in Zimbabwe under the Ramsar convention. The news comes just ahead of World Wetlands Day on 2 February and following the identification of water crises as one of the top three global risks, according to the World Economic Forum’s Global Risk Report 2016. With this year’s World Wetlands Day focusing on wetlands and livelihoods, a number of sites such as Lake Chivero, the primary water supply for Zimbabwe’s capital city Harare, are of particular significance. “When we mark World Wetlands Day, we are reminding people that water doesn’t come from a tap; it comes from healthy wetland ecosystems,” said Lifeng Li, WWF International’s Director of Freshwater. “With billions of people depending on wetlands for water, food and their livelihoods, this is a significant milestone. As world leaders think about how to implement the commitments they made under the UN Sustainable Development Goals, protecting wetlands can make a significant contribution to human well-being,” said Li. WWF has been working closely with Ramsar and the government of Zimbabwe for the protection of these sites, the first to be protected in Zimbabwe, including the world’s largest waterfall Victoria Falls and urban wetland Monavale Vlei. The wetlands face a number of threats including pollution, illegal logging and encroachment from construction projects. 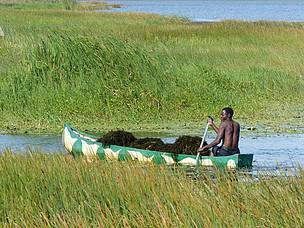 “The Ramsar Convention welcomes the designation by Zimbabwe of their first seven wetlands of international importance, bringing the number of Ramsar Sites to over 2,200 around the world. This exemplifies the importance and the value of working in close partnership with international conservation NGOs such as WWF, one of the six Ramsar International Organization Partners,” said Ania Grobicki, Acting Secretary General, Ramsar Convention on Wetlands. Wetlands are the most biologically diverse ecosystems on Earth, and act as giant sponges, soaking up rainfall and slowly releasing it over time. They also serve as natural sewage treatment works, absorbing chemicals, filtering pollutants and sediments, breaking down suspended solids and neutralizing harmful bacteria. Alarmingly, global extent of wetlands is estimated to have declined by as much as 71 per cent since 1900. WWF has supported the designation of over 100 million hectares of wetlands since 2000, representing 45 per cent of the world’s total area of wetlands designated under Ramsar since the convention was signed in 1971. The Convention on Wetlands of International Importance is an intergovernmental treaty signed by 169 countries so far. The Ramsar Convention’s mission is the conservation and wise use of wetlands, with the goal of achieving sustainable development. Cleveland Dam, one of seven new sites designated for conservation under the Ramsar convention.